Chaos terrain has a highly descriptive name. If you took a large, flat piece of chocolate, froze it, and then smacked it hard on a table, you'd see a fracture pattern like chaotic terrain. It is instantly recognizable by a tangled mess of mesas, buttes, and hills, chopped through with canyons and valleys, which in places looks partly patterned. Such terrain appears unique to Mars; Earth has no land feature that resembles it. Chaotic terrain occurs in numerous places on Mars, and always gives the strong impression that something abruptly disturbed the ground. That "something" seems to have been gigantic releases of subsurface groundwater or meltwater from ground ice. Many (though not all) chaos regions lie at the heads of broad, shallow valleys such as Ravi, Maja, Shalbatana, Ares, Tiu, and Simud Valles. 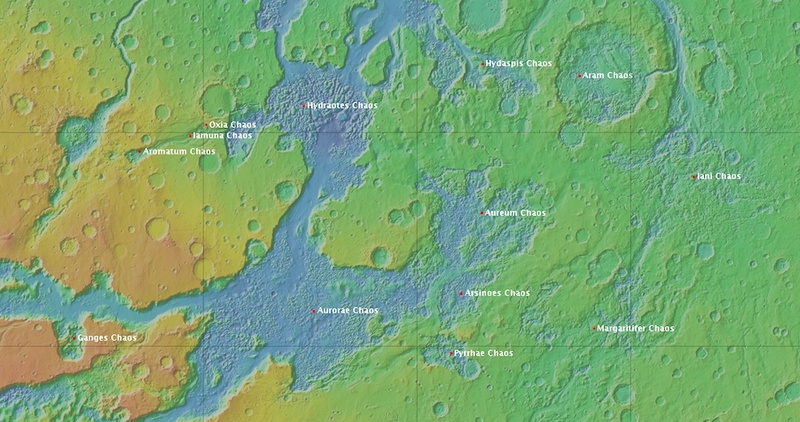 Others form in roughly circular depressions that are likely ancient impact craters. One obvious impact basin is Aram Chaos, while another, less clear-cut case is Hydraotes Chaos. How does a chaos region form? The key active ingredient, scientists think, is water. Aram Chaos, for example, began with an impact more than 4 billion years ago. 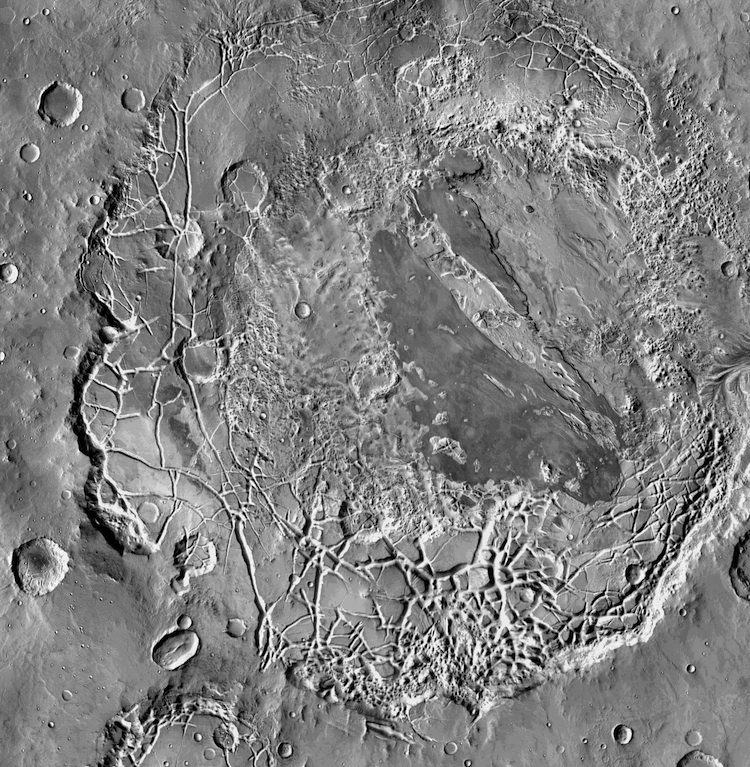 This left a basin at least 280 kilometers (175 miles) wide. As many millions of years passed, into this bowl drifted sediments: wind-blown dust, sand, and volcanic ash. The Martian climate was wetter then, so the crater-filling debris became saturated with water, which likely froze as the climate shifted and cooled. Whatever happened, warmth melted the ground ice, which immediately flowed out and away. This caused sediments to collapse, producing a network of valleys, mesas, and hills. The liberated meltwater pooled before eventually rising to overflow the basin rim on the eastern side. 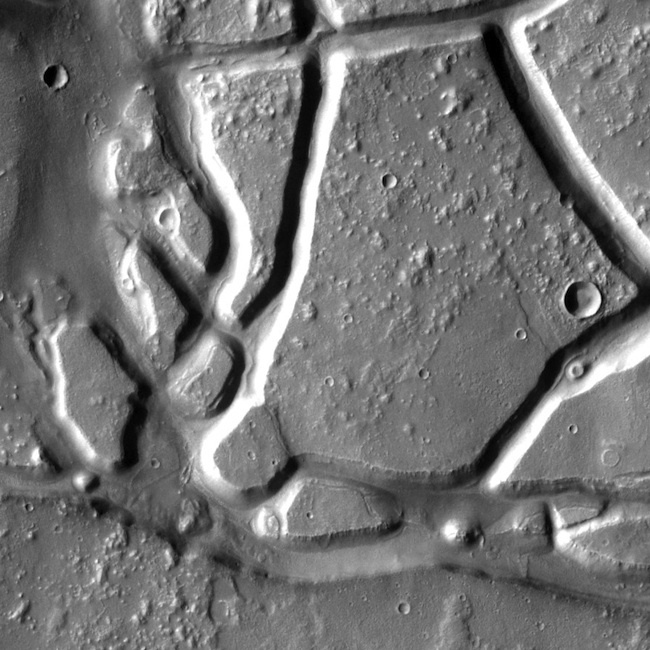 In a geological instant, a surging flood carved a narrow channel leading down into Ares Vallis nearby. In many chaos regions, elevation measurements show that the top surfaces of buttes, although generally flat, have a tilt in one direction or another. The tilt suggests that faults have caused individual mesas to slide up or down, or lean to one side, as the chaos developed. Mesa edges run parallel for many kilometers, showing that the valleys and troughs flanking the mesas widened uniformly. Where this occurs, it suggests groundwater flowed out of the mesas' sides, eroding them evenly. When examining a region of chaotic terrain, scientists look for patterns in the mesas to see if underlying tectonic or volcanic forces have played a role. Also, they look downstream to see what effects the escaped water had and where it ended up. Lastly, using multi-spectral imaging, they study the chaos terrain to examine what changes in the rocks and sediments the water caused.